Although the CDC study looked only at individuals ages 12 and over, both new and established research indicates that infants and children may be at even greater risk than the fetus from perchlorate-induced health effects. Perchlorate interferes with the thyroid's ability to take up iodine, a necessary building block for thyroid hormones. For this reason, individuals with higher iodine requirements will likely be more susceptible to adverse health effects than those who need less iodine. And it has long been known that infants and children have higher iodide requirements than adults or even pregnant women. The World Health Organization (WHO) recommends that young children and infants and ingest 3 and 7.5 times more iodine per kilogram of body weight than non-pregnant adults, respectively. 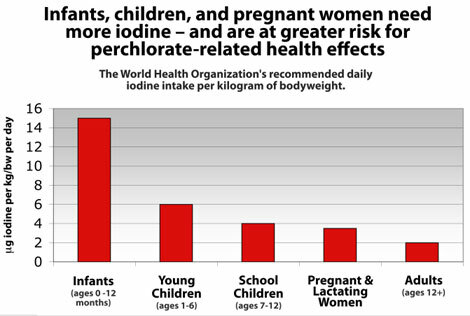 For pregnant and lactating women, WHO recommends that they ingest about 1.5 times as much iodine than other adults. These higher iodine requirements alone suggest that infants and children may be even more likely to suffer from perchlorate-related changes in thyroid hormone levels in adults. 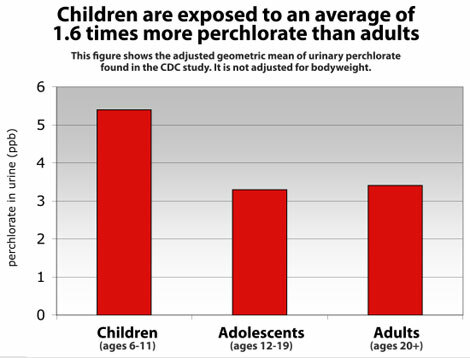 But even more troubling is new research suggesting that children also have elevated perchlorate exposures as compared to adults. Much attention has rightly been given to the disruptions of normal thyroid hormone levels during pregnancy and the subsequent effects on IQ. These studies clearly indicate that the fetus is a population of concern when it comes to perchlorate exposure. But it is also important to note that recent research shows that infants can suffer permanent neurological deficits from short-term thyroid hormone insufficiency. When such findings are considered together with infants' and children's higher iodide requirements and perchlorate exposures, it is clear that regulators must include a large uncertainty factor to account for children's increased vulnerability when basing a drinking water standard on a study that only looked at effects on adults. Of course, pregnant women and children are not the only vulnerable population who must be protected. As noted earlier, the CDC study found that women with lower iodine intake were more sensitive to perchlorate than women with normal levels. The study also found that women with low iodide intake who also were on the high end of the normal range for a thyroid hormone known as TSH were more sensitive to perchlorate than women with TSH levels closer to the median. In addition, people who are already hypothyroid, people who smoke (smoking can interfere with the thyroid's ability to use iodine), and/or who are elderly and therefore more prone to thyroid problems may also be extra sensitive to perchlorate and must be protected.